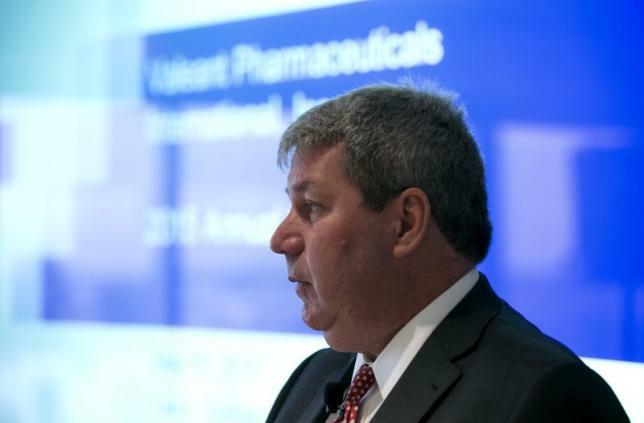 Michael Pearson, chairman of the board and chief executive officer of Valeant Pharmaceuticals International Inc, speaks during their annual general meeting in Laval, Quebec May 19, 2015. Valeant Pharmaceuticals International Inc (VRX.TO)(VRX.N) on Monday said a group of company executives will immediately take over for its chief executive officer until he returns from medical leave, news that sent its shares tumbling 10 percent. The Canadian company said CEO Michael Pearson, 56, was being treated for severe pneumonia. The decision to put leadership in the hands of three executives was unusual, experts said, and suggested a lack of confidence in any one company executive to temporarily fill Pearson’s shoes. A spokeswoman for Valeant, based in Laval, Quebec, declined to comment on the decision to appoint a trio to take over for Pearson. Valeant and Pearson have come under pressure for steep price increases on some drugs and for close ties to a specialty pharmacy that used aggressive methods to overcome insurer barriers to reimbursing its medicines. Pearson was hospitalized with the lung condition on Friday. The company spokeswoman on Monday declined to say whether he had experienced any complications or when he might return, adding it was honoring a family request for privacy. The spokeswoman also declined to comment on Pearson’s medical history. Valeant said its board has created an “office of the Chief Executive Officer,” which will include General Counsel Robert Chai-Onn, Group Chairman Ari Kellen and Chief Financial Officer Robert Rosiello. The board also created a committee to oversee and support the office of the CEO, including lead independent director Robert Ingram, president of ValueAct Capital Mason Morfit and former Valeant CFO Howard Schiller. Jerome Reisman, a partner in the law firm Reisman Peirez Reisman and Capobianco of Garden City, New York, said Valeant’s three-member CEO committee will likely prove too cumbersome. Dr. Bruce Hirsch, an infectious disease specialist at North Shore University Hospital in Manhasset, New York, said the vast majority of patients with pneumonia fully recover thanks to effective antibiotics. But others are slow to recover and can be tired for months afterward, he said, particularly if they have pre-existing structural lung disease, including damage from emphysema, bronchitis, asthma and smoking. He noted pneumonia can be caused by a range of bacteria, viruses, fungi, as well as inflammation, and in very severe cases can cause heart attacks or heart failure. Pearson, who joined Valeant as CEO in 2010 after a 23-year career at consultancy McKinsey & Co, has made rapid-fire acquisitions that greatly increased Valeant’s size and share price. But Valeant’s stock has plunged more than 60 percent since August, due largely to questions about the company’s marketing practices and the sustainability of its business model. Investors have been turning up pressure on the Laval, Quebec-based company to provide a more detailed plan on how it will boost profits in 2016. Under a deal announced this month, Walgreens Boots Alliance Inc (WBA.O) will take over many functions previously handled by specialty pharmacy Philidor Rx Services. Valeant cut ties with the Philidor in response to allegations of aggressive billing practices. Valeant shares fell 10.5 percent to $102.14 on the New York Stock Exchange.